Safe Hazardous Liquid Transfer and Storage Type I and Type II Safety Cans feature a heavy duty terne plate construction with a powder coat paint finish to resist corrosion. 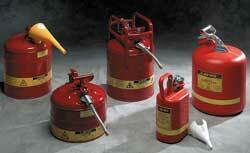 Type I Cans are designed for carrying flammable liquids you*ll be pouring into containers with wider openings. 1 Pint * 1 Gallon models feature a fixed handle with a trigger release cap. 2 * 5 Gallon models feature a swinging handle. Type II Cans have two openings * one for pouring and one for filling. Built-in flexible metal hose allows for smooth, accurate, spill-free pouring. Both styles feature a free-flow flame arrestor and an automatic pressure relief mechanism. Type II Transport/Dispensing Cans have the same quality construction as the Type II Cans, plus the added features to provide for the safe transport of hazardous liquids. Heavy-duty roll bar protect the fill and pour mechanisms. Dual fusible linked bracket prevents spillage and protects contents from explosion. Cans meet DOT, HM-181 requirements and UN approval. Type I Non-Metallic Safety Cans are made of high-density polyethylene, so they*re dentproof and puncture resistant. Can also stand up to acids, corrosive and heat. Oval Cans give your shelves 30% more storage capacity.